Internationale Buchmesse & Lesefest in Vienna, November 10-11. 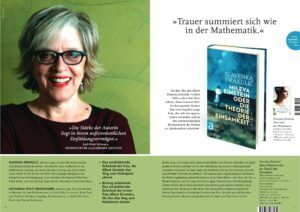 Slavenka Drakulić will participate at the Internationale Buchmesse & Lesefest in Vienna. On Friday, November 10th at 19.00 o’clock, the author will discuss literature and politics. The talk will be moderated by Annemarie Türk. The next day, on Saturday, November 11th at 12 o’clock at Literaturcafé, Drakulić will present her novel about Dora Maar and Pablo Picasso, “Dora und der Minotaurus”. The excerpts of the novel will be read by Nikolaus Kinsky and the event will be moderated by Annemarie Türk. Aufbau Verlag is soon to publish the novel MILEVA EINSTEIN ODER DIE THEORIE DER EINSAMKEIT. The novel tells the story of Mileva Maric Einstein (1875-1948), the first wife of perhaps the world’s most famous scientist, the theoretical physicist Albert Einstein (1879-1955). It encompasses the period from 1914-1933, the most difficult years of her life: a divorce after 11 years of marriage and 17 of life together, his new marriage, her struggle with severe depression and efforts to bring up their two sons, Hans Albert and his younger, increasingly disturbed brother Eduard. It ends with Eduard’s commitment to a psychiatric sanatorium. Mileva Einstein, teorija tuge was originally published in Croatian (Fraktura, Zagreb, 2016).